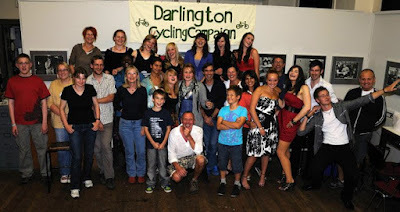 Darlington Cycling Campaign has been awarded one of just three New Ideas Fund to build on the work of the Beauty and the Bike project. The Campaign’s submission is for a bike pool of the kind of dutch-style bikes that are proving so popular amongst young women who want to cycle. With funding for between 60 and 100 bikes, and support staff to promote the bike pool in workplaces, colleges and schools, the aim is to kick-start a cycling culture in the town that is more attractive to women in particular. The documentary Beauty and the Bike, which will be premiered in Darlington Arts Centre on Wednesday 9th December, found that peer group culture is an important barrier to young women cycling. But where small groups got together to start using stylish bikes, the barriers began to crumble. The Campaign also hopes that a growing culture of gentle cycling in the town will lead to better quality infrastructure. As one of the Beauty and the Bike girls said, “We’re getting the lovely bikes, we’ve got the lovely girls to ride them. Now we are looking forward to the lovely cycle paths”.